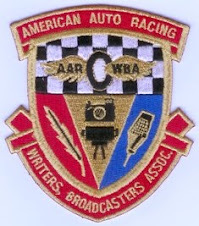 Adam Carolla, who bounded onto the entertainment scene (for many) when he partnered with Jimmy Kimmel for the cable broadcast television show "The Man Show" (1999-2004) and as his career progressed, became noted for finding, restoring, and racing historic race cars, has put together a compelling and entertaining documentary about the automobile racing life of iconic actor Paul Leonard Newman. At a recent pre-release screening of the documentary, WINNING: THE RACING LIFE OF PAUL NEWMAN, Adam Carolla shared that his interest in restoring winning Datsun/Nissan race cars became the "Happy Coincidence" (stated by Adam at 15:15 in the Q&A) that led him to discover this somewhat unknown life about how Paul Newman, after becoming one of the brightest stars in Hollywood through his acting, in his late forties ... late in life for a race car driver, focused his pursuits at being a standout race car driver and top level racing series team owner. 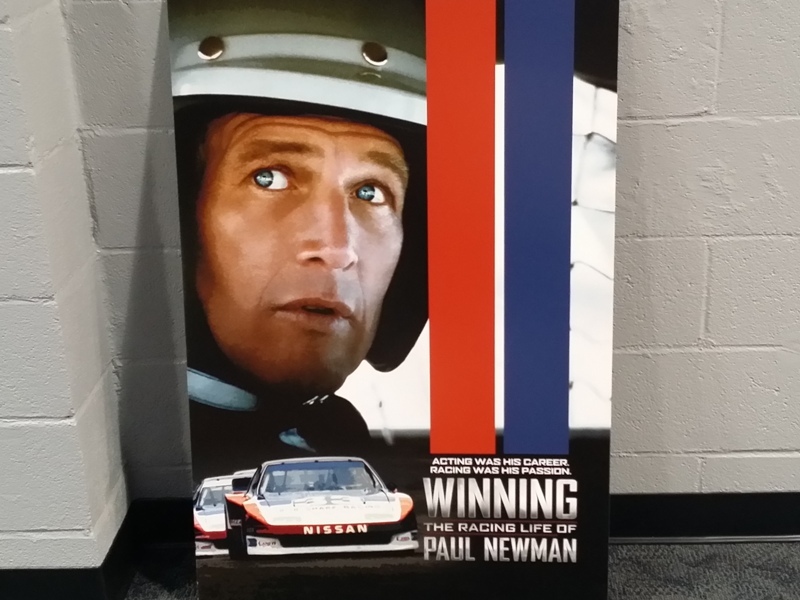 The following sixteen minutes is what Adam Carolla and co-producer Nate Adams had to say in a post-screening Q&A about their film effort involved in the making of WINNING: THE RACING LIFE OF PAUL NEWMAN. Synopsis: The world knows Paul Newman as an Academy Award winning actor with a fifty-plus year career as one of the most prolific and revered actors in American Cinema. He was also well known for his philanthropy; Newman's Own has given more than four hundred and thirty million dollars to charities around the world. Yet few know the gasoline-fueled passion that became so important in this complex, multifaceted man's makeup. Newman’s deep-seated passion for racing was so intense it nearly sidelined his acting career. 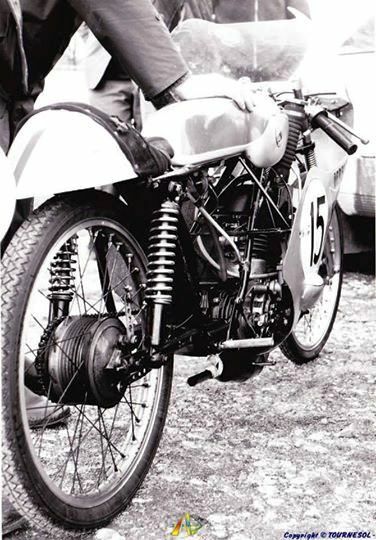 His racing career spanned thirty-five years; Newman won four national championships as a driver and eight championships as an owner. Not bad for a guy who didn't even start racing until he was forty-seven years old. After having a fairly interesting week of watching the Verizon IndyCar Series work in, and understand, the new aerodynamics kits for large oval racing that were added to their Dallara DW12 racing platforms, and after the weather elements washed out any chance of holding the scheduled 4-lap qualification runs used to decide where the drivers would line up for the INDY 500 race, then, lastly, a third Chevy chassis spun and turned around backwards causing the chassis to lift off of the track surface, Race Control saw fit to shut down all of the team and driver development understanding achieved over hundreds of laps logged at the old Brickyard. One might say ... IndyCar Race Control "Bricked" the 99th Indianapolis 500 qualifications. The 2015 season at this point has had more going wrong with the competition and fan enjoyment than at almost anytime during these merger years. To understand and gain a perspective on how the decisions made for Sunday's augmented qualifications session played out, one needs a brief review of the 2015 season. 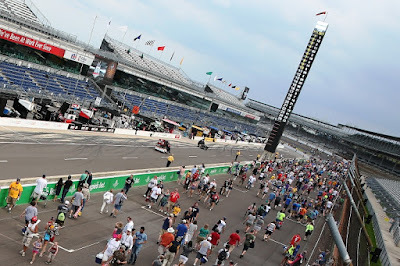 and finally, if this idiocy of INDY500 decision-making keeps up, the crown jewel of Speedway, Indiana during the month of May might become the Grand Prix of Indiana as opposed to the INDY 500 because, again, the Race Control by committee crowd allowed competition to break out (OH! ... and it was a road race). It wasn’t as big a circus as 1997, when every bit of integrity and competition got kicked to the curb so the Indy Racing League could avoid the public relations nightmare of not starting the fastest 33 qualifiers. 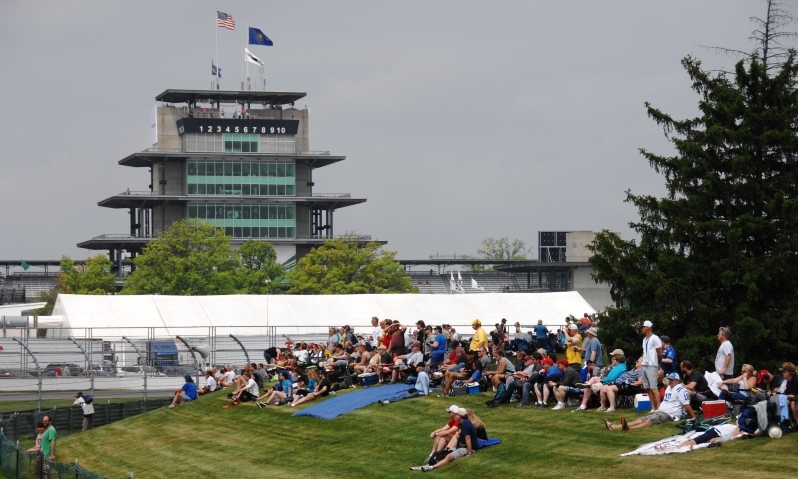 But Sunday’s sideshow at the Indianapolis Motor Speedway would have surely brought a little smirk to Barnum & Bailey. 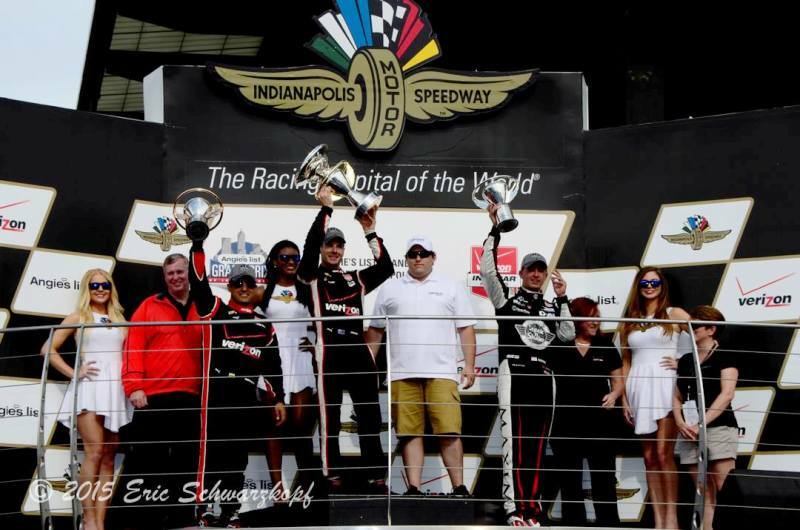 A lot of panic, a little knee jerk, possibly some politics, a little confusion and a lot of “WTF?” summed up a very forgettable and embarrassing day in IMS history. From the time Ed Carpenter flipped in morning practice to the inane Last Row battle, it looked more like the Speedrome instead of Speedway. Carpenter’s crash was the third in which a Chevrolet­powered Dallara driver wound up on his head. Helio Castroneves got upside down on Wednesday, followed by Josef Newgarden on Thursday. All three drivers escaped injury but not speculation. Why were their Indy cars suddenly sailing? The finger was pointed at the new aero kits with the angled tire ramps and ramps inside the rear wheel pods or the vertical wickers on the nose but was countered by the Physics Police who reasoned as long as there are tunnels under a car and it goes backward there is going to be lift. 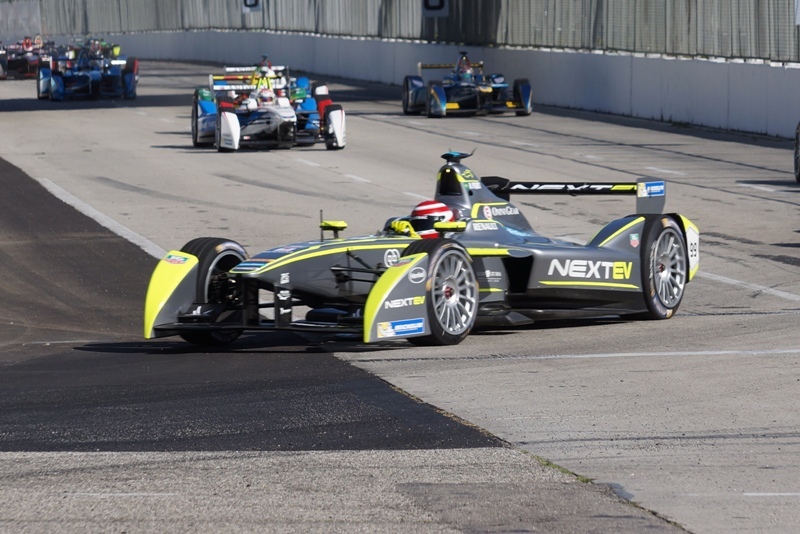 Everyone seemed to have a theory except IndyCar, which offered nothing publicly until Sunday. 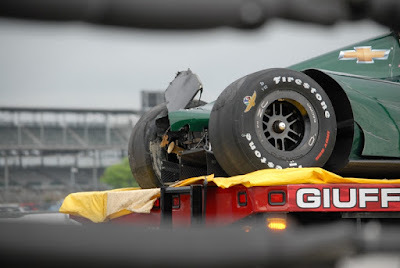 “We knew the cause of the first two wrecks were very different and that probably obscured the overall concern,” said Hulman & Company CEO Mark Miles, who at least chose Indy qualifying over golf this weekend. IndyCar did mandate those vertical wickers be removed from all Chevys, but not the Hondas, after Helio flew. Of course Carpenter crashed with no wicker but using the extra boost for qualifying while Castroneves had the wicker and normal horsepower before a tank­slapper sent him into the wall. 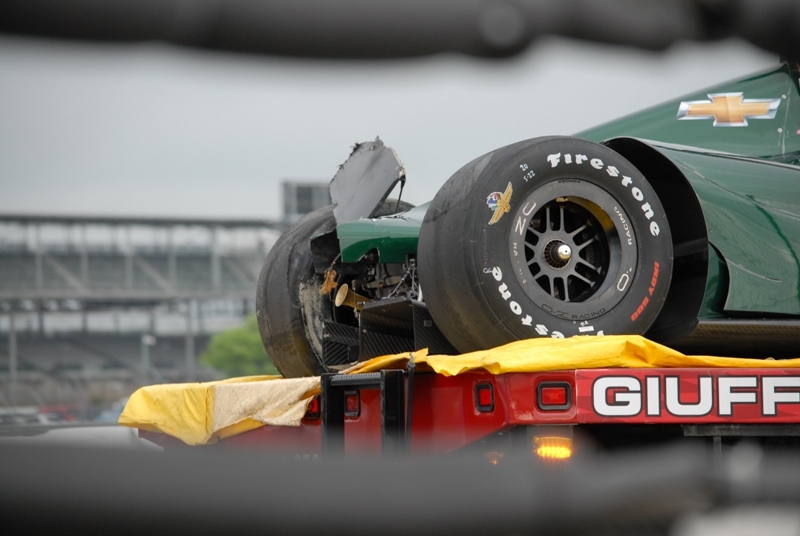 Newgarden had no wicker and no added boost in a crash caused by a deflated tire. Even though Carpenter snapped loose before climbing the wall backwards and flipping over, it was his accident that suddenly sent IndyCar officials into DefCon 1. So when IndyCar sent out the word that it was taking away the extra power for qualifying and all the cars would have to start the race in the aero package they used to qualify (which instantly slowed the cars by several miles an hour), it created some predictable emotions in Gasoline Alley. “We look like a bunch of pussies,” said one driver. “It’s amateur hour, they’re throwing darts at a board,” said a former IndyCar champion of the process. Honda drivers and teams bit their tongue but the obvious question was why did Honda have to abide by the edict? Competition director Derrick Walker replied: “Just because we’ve seen three incidents happen with a Chevrolet doesn’t mean that there aren’t three Hondas out there that are likely to happen [fly while going backward] or could happen. I can assure you that Honda doesn’t believe that they have any issue, but then again, they will admit right now that we don’t have that answer. Was it more about safety or competition? Chevy has clearly been ahead of Honda in pace this season and this month (with or without extra boost) so it’s not like Honda lost any advantage, other than its cars weren’t flipping at any speed or under any configuration. Three accidents force a total change in philosophy? Sending drivers out with a combination they hadn’t run all month for a short practice session before qualifying hardly seemed safe but that’s what happened. And naturally the day ended with some head shaking stupidity. Instead of letting the Fast 9 at least get one chance to battle for the pole, the hearty but tiny gathering of fans that hung around had to endure the dramatic duel to see which one of the 34 drivers was [to be] sent home. IndyCar opted to have the slowest four drivers go back out to eliminate one of them in an effort to keep the insulting “Bump Day” theme alive. Robin Miller (Racing, Viewpoints) was very correct to cite the 1997 IRL embarrassing INDY500 event because - and this is the reason - The Hulman/George decision-making Race Control by committee of 2015 was what had the event of last weekend's 99th INDY 500 qualifications feel so similar and familiar. We are reliving the Tony George inspired competitive attitudes that the IRL gave American Open Wheel Racing right now in 2015. We have a racing series that is being run by a committee of pussies and one of them has been brought back (TGBB) after being replaced (with reason) a few years ago ... need we say more? Robin Miller​ spanks the system but does not call them out as morphing into the IRL of old ... running the present day. Ira Fierberg · Friends with Dicken Wear and 82 others - If you watched the coverage on Sunday, Roger Penske was interviewed and several times during the interview he referred to the sanctioning body as "The IRL"! Can the reinstatement of Tony George as Chief "Clown & Mucky-Muck" be too far behind? 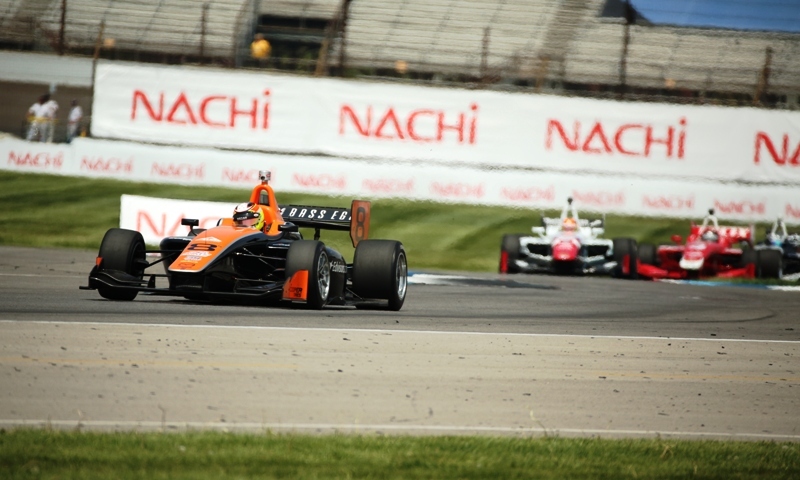 At GP Of INDY It's Rayhall vs. Rahal ('RAyHALl') ... Is There An Echo In Here? At the Indianapolis Motor Speedway (IMS) during the final day of competition during the Grand Prix of Indianapolis, the only name heard, it seemed, was the sound made by the last name of a one-time Indy 500 winner (1986) - Bobby Rahal. 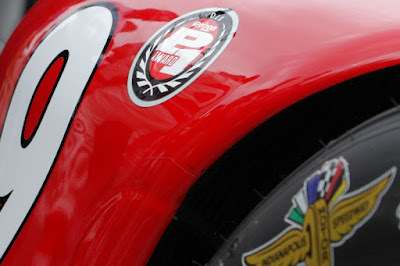 In this case the name heard belonged to two different drivers in separate open-wheel series, although sounding the same, was spelled in two different ways. 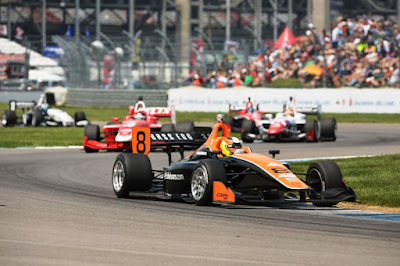 The first session of the day belonged to a first-time driver in new IndyLights Series (that features a new Dallara racing platform powered by Mazda that looks like disturbingly like the ChampCar DP01 - down to the louvers in the sidepod) by the last name of Rayhall ... Sean Rayhall (8Star Motorsports). He began the two race event by qualifying third and finishing second in Race 1 where he received a Podium trophy. on this final day of the event weekend, he began Race 2 in P2 along side of season series points leader and polesetter Ed Jones ... drafted his way down the front straight to put on a clean pass in Turn 1 and young Rayhall was never seriously challenged after the second GREEN Flag flew for the balance of the 35 lap race. Sean Rayhall (#8 Bass Egg and Edvisors-8Star Motorsports): "In my head, that was longer than the six hours I've driven in endurance races! Jack was probably faster than me, but I was trying to save my tires for the end in case he got close. The restart had me nervous but I used a little trick I picked up driving Late Model (stock) cars to keep him back. After that, the only thing that was going through my head was to keep hitting my marks. I never expected this. Racing against guys like Max, RC, Ed, these guys have been doing open-wheel racing for the last five or six years, while I've done endurance racing. I'm inexperienced compared to them; it was an honor yesterday just to be on the podium with them so to be able to win, I'm just blown away. In the end, it's another race car. It's a switch in your head; you go from one to another, you drive different styles and push in different ways but you get to a point where you can flip it on and flip it off." He improved all event weekend long at the IMS infield road course where he posted a P5 in Practice 1, a P6 in Practice 2, A P3 in Qualifications, A Podium P2 in Race 1, a P1 in Practice 3, and brought home the Podium hardware in Race 2 with the winner's trophy and bragging rights for next year if he is still driving IndyLights. Rayhall crossed the finish line 4.9438 seconds ahead of RC Enerson (Schmidt Peterson Motorsports with Curb-Agajanian). 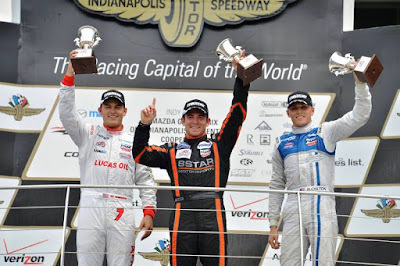 Max Chilton (Carlin) finished third. After seven of 16 races, Ed Jones (Carlin) holds the provisional points lead (176), 14 ahead of Jack Harvey (Schmidt Peterson Motorsports with Curb-Agajanian). After only two races, Sean Rayhall (8Star Motorsports) has P11 in the points (81) out of 14 drivers with points. 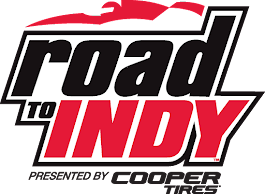 Which brings us to the main event of the weekend, the fifth race of the Verizon IndyCar Series - Grand Prix of Indianapolis, and the other Rahal ... Graham Rahal. Coming off a stirring run to a second-place finish in the previous IndyCar race, Graham Rahal spoke of renewed momentum for the Rahal Letterman Lanigan race team headed into Saturday’s second Grand Prix of Indianapolis. He stuck with the momentum on Friday, but after qualifying he wasn’t happy. Neither were most of the other 11 drivers in the 25-car field who are using Honda engines and aerodynamic devices. Chevrolet drivers smoked them. 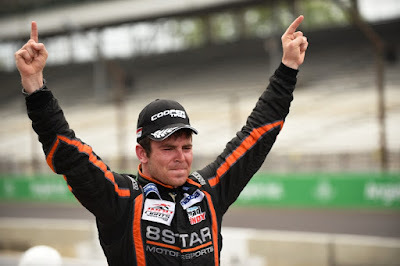 Team Penske’s Will Power led the way, taking the pole for the race on the road course at Indianapolis Motor Speedway. The “fast six” final qualifying was all Chevy; the top 12 who advanced to second-round qualifying included just one Honda, Jack Hawksworth from the Foyt Racing team, who wound up 11th. It was like taking a “knife to a gun fight,” said Rahal, who will start 17th. This year, IndyCar moved from stock bodies for all of the cars to aero kits (the downforce-inducing wings and pods on the cars) designed and produced by the two engine manufacturers in the series. If a team uses Honda engines it also uses the Honda aero kit. The same with Chevy. Through the first four races and headed into the fifth, all on road or street courses, Chevy aero kits routinely have produced the faster times. The Chevy drivers know there is a disparity. There is a chance of rain for the race today, which could close that gap. The race was run and it wasn't wet ... just a little messy at first, and fast (only one Full Course YELLOW Flag). Lap 1: GREEN flag at 3:49 p.m. 1-Power leads the field into Turn 1. FULL COURSE CAUTION, contact in Turn 1 involving 9-Dixon, 3-Castroneves, 41-Hawksworth, 5-Hinchcliffe and 21-Newgarden. 3-Castroneves and 5-Hinchcliffe keep going. 9-Dixon, 41-Hawksworth and 21-Newgarden are stopped in Turn 1, assisted by the Holmatro Safety Team, restarted and return to the field. Lap 2: Pits are open. Pitting are: 25-Wilson (replace front wing), 83-Kimball, 5-Hinchcliffe, 3-Castroneves, 7-Jakes, 9-Dixon (replace front and rear wings), 21-Newgarden (replace rear wing), 18-Huertas, 41-Hawksworth (replace front wing). Lap 4: GREEN flag. 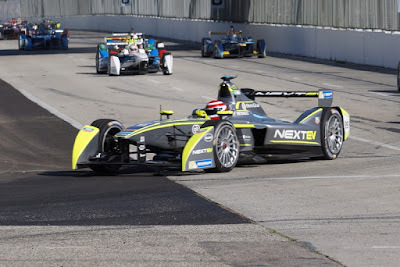 1-Power leads 22-Pagenaud. 15-Rahal has advanced 11 positions from the start to sixth place. It never rained and Rahal didn’t require its services. 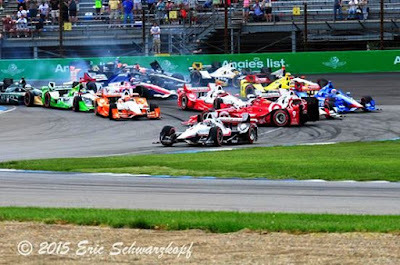 Thanks to a Lap 1, Turn 1 crash involving Helio Castroneves, Scott Dixon, Jack Hawksworth and Josef Newgarden, Rahal was able to go from 17th to sixth before he made it to Turn 5 on the opening lap. Then a strategy of pitting a lap later than the leaders put Rahal into the top three and within reasonable distance of Power. He led nine laps during green flag pit stops, but afterward was never able to make up full deficit due to lapped cars. It should feel good, though finishing second is undoubtedly getting old. Still, Rahal, now fifth in points with his single-car team, has multiple podiums in a season for the first time since the 2011 campaign when Rahal notched three with Chip Ganassi Racing. This Verizon IndyCar Series season now has had 5 races with the last two showing great promise for the rest of 2015. Some complaints about the lack of Mushroom Busting or Trailing Turbulence which reduces an ease in passing with one of the most vocal drivers in the on-air post race comments being Sebastien Bourdais (starting P7 and finished P4). Don't tell this to Graham Rahal (race's most improved 15 positions - started P17 - Finished P2) or, Helio Castroneves (started P3, booted Dixon in Turn 1, dropped back to P23 or P24 on Lap 10 pitstop, finished P6), or for that matter, the Verizon IndyCar Series PR department who is boasting 192 passes for position on the track, 11 lead changes and six leaders in the 82-lap race. No matter how it's spelled (Rayhall / Rahal) it all sounds the same and that "RAyHALl" sound heard throughout the paddocks, for most all of the day, Saturday, is the sound the of success few other names have at the 2nd annual Grand Prix of Indianapolis. What a way to start the "Month Of May" at IMS. Next up ... practice for the 99th running of the Indianapolis 500 will begin May 11 (racecontrol.indycar.com). 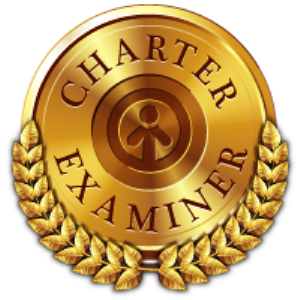 Qualifications will be May 16 - ABC @ 4:00 pm - 6:00 pm ET and May 17 - ABC @ 1:00 pm - 3:00pm ET - includes V E R I Z O N I N D Y C A R S E R I E S – Q U A L I F Y I N G – F A S T 9 (racecontrol.indycar.com). 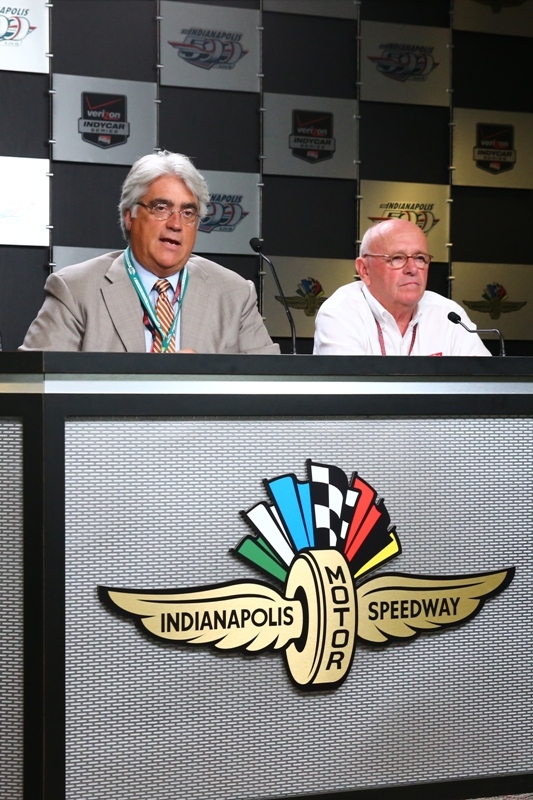 Coors Light Carb Day will be May 22 (racecontrol.indycar.com). The INDY 500 race will be May 24 and televised at 12:00pm ET on ABC Networks and racecontrol.indycar.com. Mazda North American Operations handed over the keys to 13 all-new 2016 Mazda6 and CX-5 vehicles to staff of Mazda Raceway Laguna Seca during this past weekend's Continental Tire Monterey Grand Prix Powered by Mazda. The cars, emblazoned with Mazda-designed graphics, will become a staple on the Monterey Peninsula landscape and special events. "We are extremely grateful and fortunate to have Mazda as a partner," commented Gill Campbell, CEO/general manager of Mazda Raceway Laguna Seca. "Their enthusiasm, guidance and ongoing activations throughout the year are remarkable, and enable us to host major international races each year." 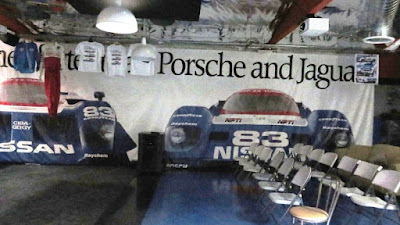 Affectionately known as "Camp Zoom-Zoom" among Mazda officials, the automaker regularly uses Mazda Raceway to conduct new product launches, media drives, engineering tests and dealer meetings. 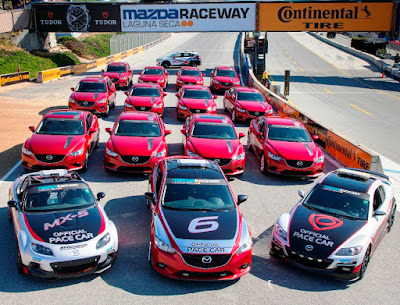 "As we kick off our sixteenth season of partnership with Mazda Raceway, it's always fun to see the new fleet of Mazda vehicles arrive with the track's hard-working team," said Robert Davis, Senior Vice President, US Operations, for Mazda North American Operations. 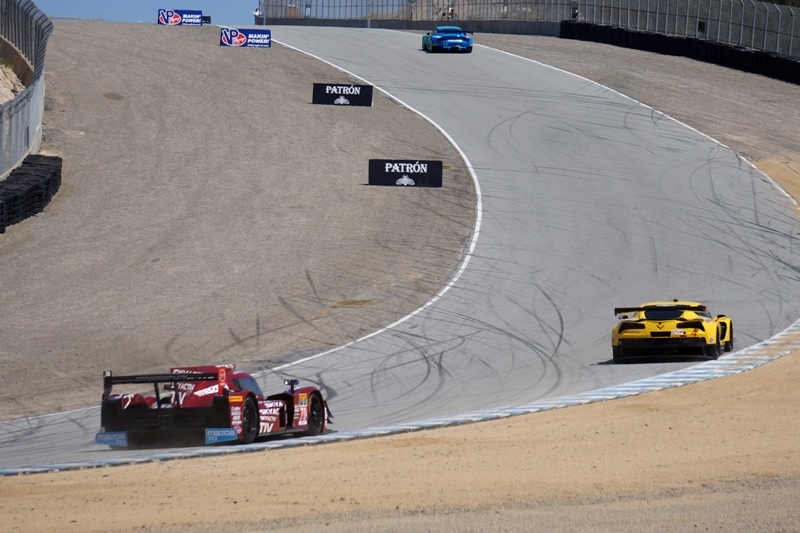 "Some companies put their names in places that just don't make sense, but the reason for our ongoing partnership is that motorsport is in our blood, and Mazda Raceway is one of the most iconic race facilities in the world. We look forward to many more years of partnership." The 2016 Mazda6 is the flagship model in Mazda's new-generation product lineup. It has earned high acclaim in markets around the world thanks to the alluring vitality of the "KODO - Soul of Motion" design language and SKYACTIV Technology's balance of driving pleasure, environmental performance and safety. Mazda went to extraordinary lengths to bring new levels of depth and maturity to every aspect of the 2016 model. In addition to an innovative interior design, the updated refreshed Mazda6 offers the customer greater sophistication and value with enhanced exterior design, functionality, ride comfort, quietness and safety. The 2016 Mazda CX-5 was the first model to fully adopt SKYACTIV TECHNOLOGY and the "KODO - Soul of Motion" design language. The model offered much more than the basic values of utility and practicality that customers expect from an SUV and it delivers high levels of both driving pleasure and environmental and safety performance. Since the launch of the original model, Mazda has made steady refinements to the CX-5 each year, aiming to deliver customers even greater value and sophistication. 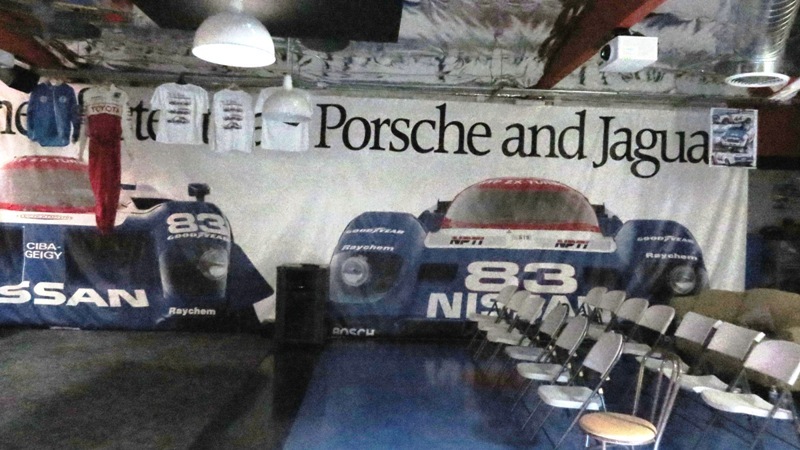 Since Mazda became title sponsor of the iconic motorsports and events facility in 2000, located in the destination-rich Monterey Peninsula, Mazda has had a prolific presence. The Soul Red Metallic vehicles serve a variety of purposes, from utilitarian duties and participating in parades and civic activities, to serving as pace cars. "The Mazdas are instrumental in our jobs," added Campbell. The next race at Mazda Raceway Laguna Seca is the MotoAmerica & FIM World Superbike Championship, GEICO Motorcycle U.S. Round July 17-19. For ticket information and a complete season lineup, visit MazdaRaceway.com or call 831-242-8200. For information on the full Mazda new model lineup, visit MazdaUSA.com. Funny what pursuits in motor culture one finds bounding through social media news feeds. 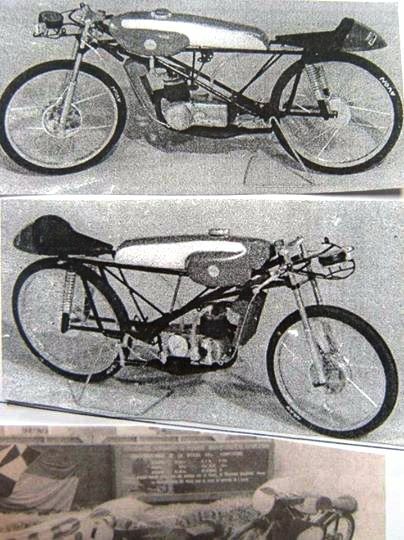 In this case, a submission by driver, collector, historian, builder, standards judge, and artist (more could have been added) Philippe de Lespinay about his past in Grand Prix motocycle racing and the query on a model built and presented to a onetime benefactor to his exploits. "52 years ago, I built [a model of] this 1963, 1/8 scale Derbi 50cc 7-speed Grand Prix motorcycle using only basic materials: soldered steel-wire frame, wooden engine and fuel tank, wheels made from plumbing fiber gaskets... those were the days! 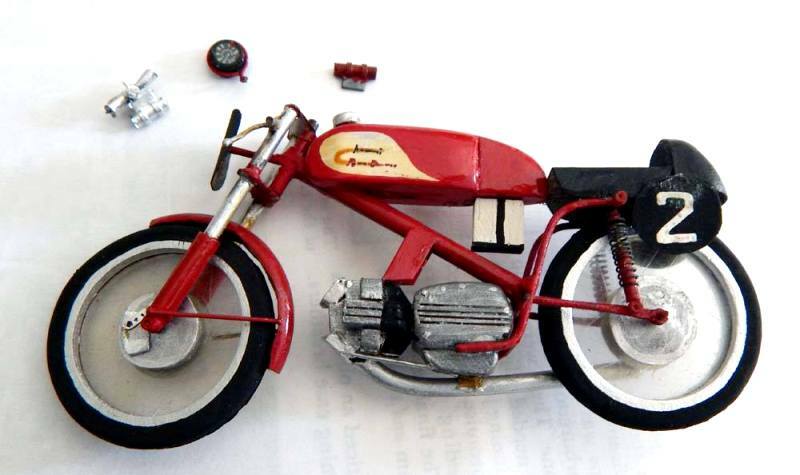 I gifted it [the model] to the late Jacques Roca, who had been instrumental in helping me begin my racing career. Not sure if it survived in his estate ... these pictures were found in a period magazine." If anyone knows additional information on this brief news feed item, please leave a comment (and a link, if helpful) so this can be passed on to Mr. de Lespinay. Anticipation was the word going into the Continental Tire Monterey Grand Prix weekend of races at Mazda Raceway Laguna Seca, May 1-3, 2015. 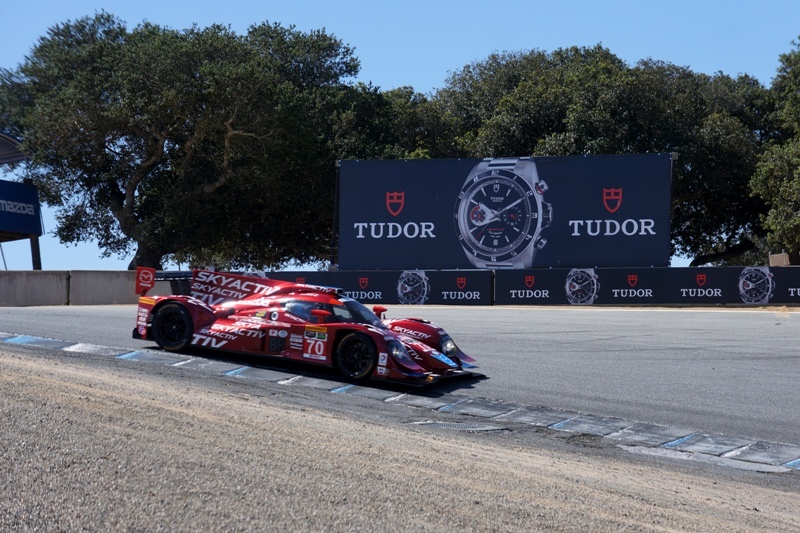 The Mazda SpeedSource SKYACTIV Prototype diesel-powered team effort seems to be a bit frustrated after just three races into this 12 race Tudor United Sports Car Championship season. After finishing no better than 7th this season, the feeling throughout the Mazda SpeedSource Prototype paddock was this would be the race for a breakthrough since these cars and the type of torque and mileage delivered by the experimental SpeedSource SKYACTIV Diesel engines seems suited to the multiple turns, elevation changes, and shorter straights characterized by the corporate named track near Monterey. There’s a new kind of pressure on the Mazda SpeedSource Prototypes for this weekend’s Continental Tire Monterey Grand Prix powered by Mazda. 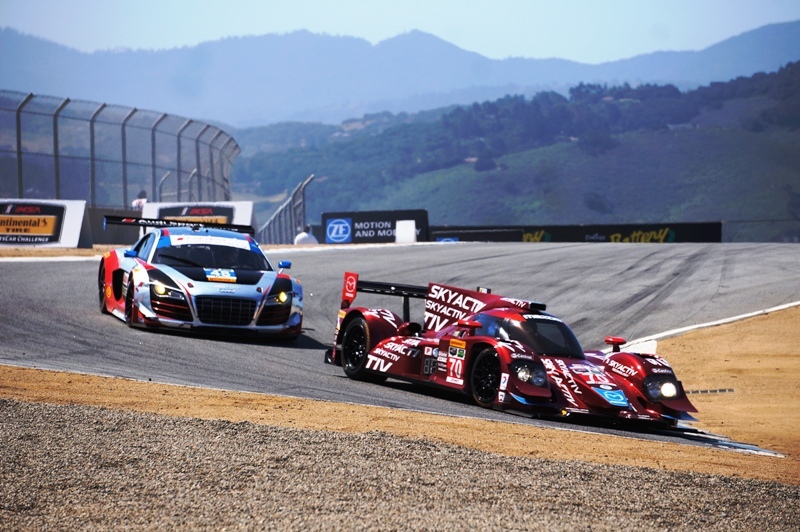 Race number four for the TUDOR United SportsCar Series will take place Sunday, May 3 at Mazda Raceway Laguna Seca in Monterey, Calif. The two-hour, forty-minute race takes place at a track which plays into the strengths of the chassis and SpeedSource SKYACTIV Diesel engines. 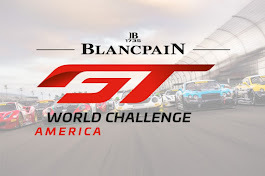 The team aims to live up to the pressure of heightened expectations with drivers such as Jonathan Bomarito, who grew up in Monterey, and Tom Long, who will be pulling triple duty through the weekend. Long has three distinct roles this weekend at Mazda Raceway. In addition to driving the No. 07 Prototype, he will be racing in the Continental Tire SportsCar Challenge race in a Mazda MX-5 with Freedom Autosport. The pair of sleek Corporate colored and SKYACTIV liveried Soul Red cars are coming off of their best finishes of the year, with the SpeedSource No. 07 finishing seventh and the SpeedSource No. 70 finishing eighth (out of a field of 9 cars in class) at the Tequila Patron Sports Car Showcase at the Grand Prix of Long Beach. 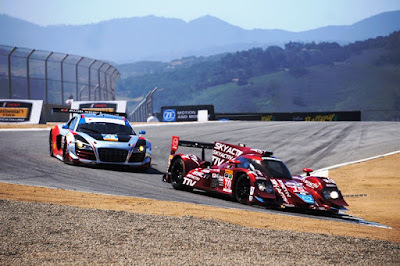 The weekend hopes had a promising beginning because for the second time in four races, a Mazda SpeedSource SKYACTIV Prototype led the race. At about 45 minutes into the 2 hr. and 40 min. trophy dash, after starting eighth in a nine car class field. The No. 70 Mazda Prototype with drivers Tristan Nunez and Jonathan Bomarito recorded a finish of sixth in class and seventh overall in today's Continental Tire Monterey Grand Prix powered by Mazda. Both numbers match the best-ever results for the diesel-powered Mazda Prototypes, which began an aggressive development program in 2014. Tristan Nunez, who started the race in the No. 70 car, led seven laps, taking advantage of the fuel economy from the diesel engine. It is the second race that Mazda has led this season. The sister car, the No. 07, started strong with driver Tom Long before dropping out of the running early with engine issues. Long and teammate Joel Miller finished ninth in the Prototype category. About repeatedly lowering his personal-best lap times late in the race: 'When the field gets spread out, you're almost racing yourself. Primarily, you're managing traffic and trying to keep improving that lap time. That's what keeps you motivated and pushing, and we were running a really decent pace at the end of the race. SpeedSource celebrated its 20th anniversary on Monday, the day after this weekend’s Continental Tire Monterey Grand Prix powered by Mazda. 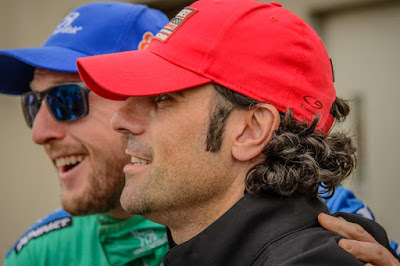 Next race, SpeedSource hopes to have both cars finish and place setting new marks in race five to be held May 30, 2015 at the Chevrolet Sports Car Classic Presented by Metro Detroit Chevy Dealers at Belle Isle near Detroit, Michigan.